Summary: It is very easy for a vegan diet to meet the recommendations for protein, as long as calorie intake is adequate. Strict protein combining is not necessary; it is more important to eat a varied diet throughout the day. Some Americans are obsessed with protein. Vegans are bombarded with questions about where they get their protein. Athletes used to eat thick steaks before competition because they thought it would improve their performance. Protein supplements are sold at health food stores. This concern about protein is misplaced. Although protein is certainly an essential nutrient which plays many key roles in the way our bodies function, we do not need huge quantities of it. In reality, we need small amounts of protein. Only one calorie out of every ten we take in needs to come from protein.1 Athletes do not need much more protein than the general public.2Protein supplements are expensive, unnecessary, and even harmful for some people. How much protein do we need? The RDA recommends that we take in 0.8 grams of protein for every kilogram that we weigh (or about 0.36 grams of protein per pound that we weigh.1 This recommendation includes a generous safety factor for most people. When we make a few adjustments to account for some plant proteins being digested somewhat differently from animal proteins and for the amino acid mix in some plant proteins, we arrive at a level of 1 gram of protein per kilogram body weight (0.45 grams of protein per pound that we weigh). Since vegans eat a variety of plant protein sources, somewhere between 0.8 and 1 gram of protein per kilogram would be a protein recommendation for vegans. If we do a few calculations we see that the protein recommendation for vegans amounts to close to 10% of calories coming from protein. For example, a 79 kg vegan male aged 25 to 50 years could have an estimated calorie requirement of 2900 calories per day. His protein needs might be as high as 79 kg x 1 gram/kg = 79 grams of protein. 79 grams of protein x 4 calories/gram of protein = 316 calories from protein per day. 316 calories from protein divided by 2900 calories = 10.1% of calories from protein.] If we look at what vegans are eating, we find that between 10-12% of calories come from protein.3 This contrasts with the protein intake of non-vegetarians, which is close to 14-18% of calories. So, in the United States it appears that vegan diets are commonly lower in protein than standard American diets. Remember, though, with protein, more (than the RDA) is not necessarily better. There do not appear to be health advantages to consuming a high protein diet. Diets that are high in protein may even increase the risk of osteoporosis and kidney disease.4,5 To meet protein recommendations, the typical adult male vegan needs only 2.5 to 2.9 grams of protein per 100 calories and the typical adult female vegan needs only 2.1 to 2.4 grams of protein per 100 calories. These recommendations can be easily met from vegan sources. It is very easy for a vegan diet to meet the recommendations for protein. Nearly all vegetables, beans, grains, nuts, and seeds contain some, and often much, protein. Fruits, sugars, fats, and alcohol do not provide much protein, so a diet based only on these foods would have a good chance of being too low in protein. However, not many vegans we know live on only bananas, hard candy, margarine, and beer. Vegans eating varied diets containing vegetables, beans, grains, nuts, and seeds rarely have any difficulty getting enough protein as long as their diet contains enough energy (calories) to maintain weight. What about combining or complementing protein? Doesn’t that make the protein issue much more complex? Let’s look at a little background on the myth of complementing proteins. 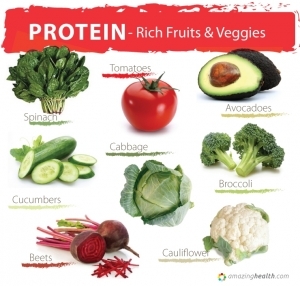 Protein is made up of amino acids, often described as its building blocks. We actually have a biological requirement for amino acids, not for protein. Humans cannot make nine of the twenty common amino acids, so these amino acids are considered to be essential. In other words, we must get these amino acids from our diets. We need all nine of these amino acids for our body to make protein. Some people say that eggs, cow’s milk, meat, and fish are high quality protein. This means that they have large amounts of all the essential amino acids. Soybeans, quinoa (a grain), and spinach also are considered high quality protein. Other protein sources of non-animal origin usually have all of the essential amino acids, but the amounts of one or two of these amino acids may be low. 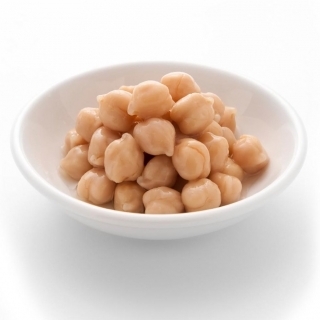 For example, grains are lower in lysine (an essential amino acid) and legumes are lower in methionine (another essential amino acid) than those protein sources designated as high quality protein. Even if you ate only one food and not the variety of foods typical of a vegan diet, you would probably get enough protein and essential amino acids. Remember, almost all protein sources of non-animal origin contain all of the essential amino acids. You would have to eat a lot of the protein source (if there was only one source of protein in your diet) to meet essential amino acid needs. This article is used by permission from Reed Mangels, PhD, RD, The Vegetarian Resource Group. Visit www.vrg.org to find out more. 1. Food and Nutrition Board, Institute of Medicine, Dietary Reference Intakes for Energy, Carbohydrate, Fiber, Fat, Fatty Acids, Cholesterol, Protein, and Amino Acids (Washington, DC: National Academy Press, 2002). 2. “Nutrition and athletic performance—Position of the American Dietetic Association, Dietitians of Canada, and the American College of Sports Medicine,” J Am Diet Assoc 100 (2000): 1543-56. 3. V. Messina, R. Mangels, M. Messina, The Dietitian’s Guide to Vegetarian Diets second edition (Sudbury, MA: Jones and Bartlett Publishers, 2004). 4. D. E. Sellmeyer, K. L. Stone, A. Sebastian, et al., “A high ratio of dietary animal to vegetable protein increases the rate of bone loss and the risk of fracture in postmenopausal women,” Am J Clin Nutr 73 (2001): 118-22. 5. E. L. Knight, M. J. Stampfer, S. E. Hankinson, et al., “The impact of protein intake on renal function decline in women with normal renal function or mild insufficiency,” Ann Intern Med 138 (2003): 460-7. 6. F. M. Lappe, Diet for a Small Planet (New York: Ballantine Books, 1971). 7. V. R. Young, P. L. Pellett, “Plant proteins in relation to human protein and amino acid nutrition,” Am J Clin Nutr 59 (1994): 1203S-2011S. 8. A. R. Mangels, V. Messina, V. Melina, “Position of The American Dietetic Association and Dietitians of Canada: Vegetarian diets,” J Am Diet Assoc 103 (2003): 748-765.